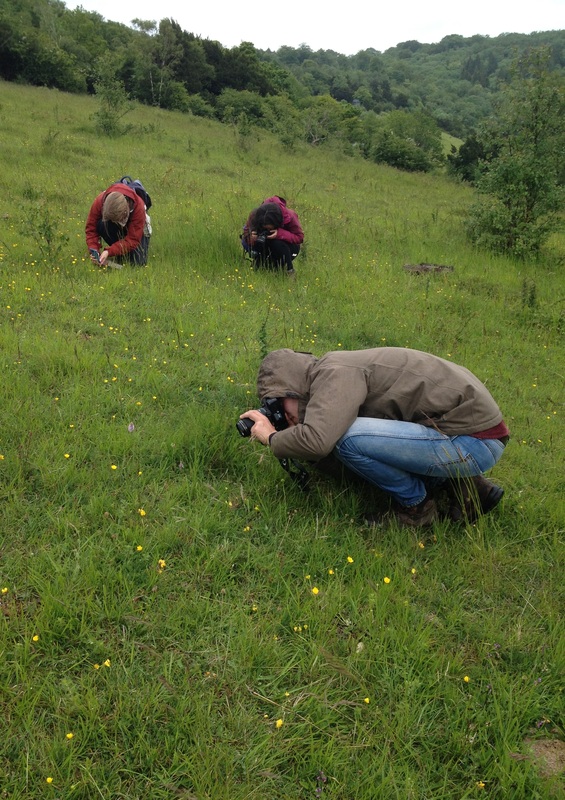 The Orchid Observers team would once again like to thank all our participants who have been out photographing orchids and collecting records from all over the country – with 1655 records submitted so far this is a fantastic field effort! Of these records, an assessment by the Botanical Society of Britain and Ireland (BSBI) shows that more than 200 of these sites are new locations for some species. 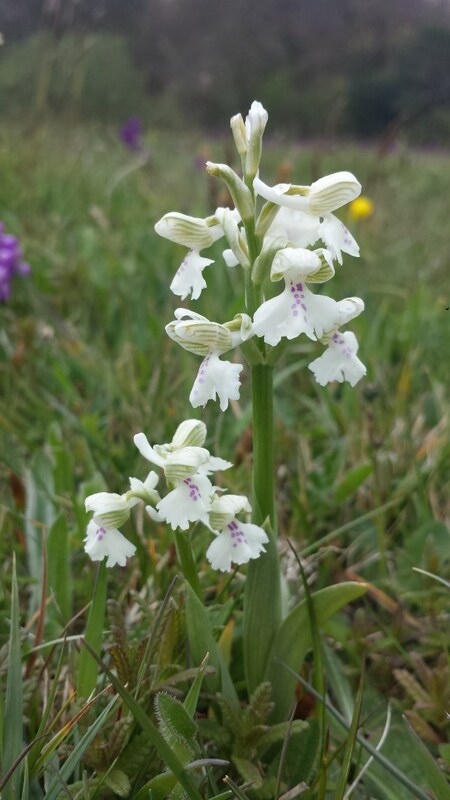 Of particular interest are several previously unknown locations for green-winged orchid (Anacamptis morio) which is listed as ‘near threatened’, and white helleborine (Cephalanthera damasonium) which is considered to be ‘vulnerable’ to extinction in the UK. If you are up in northern England and in north-east parts of Scotland and likely to be visiting and walking in woodland, particularly pine woods, then look out under the pine trees on the forest floor for small spikes of creamy white flowers which are very hairy! 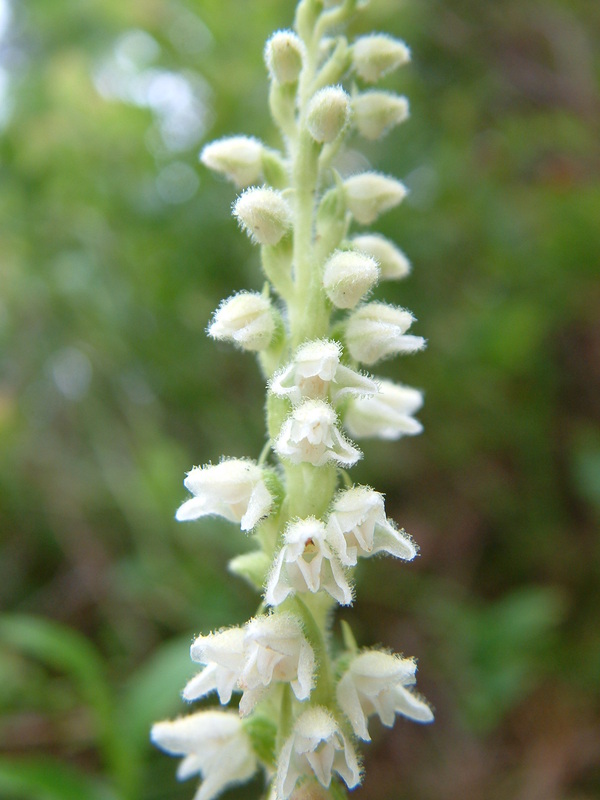 Take a look at the leaves; if the veins are distinctively net-shaped (rather than parallel as in most UK orchids) then you may well have found Creeping lady’s-tresses (Goodyera repens). 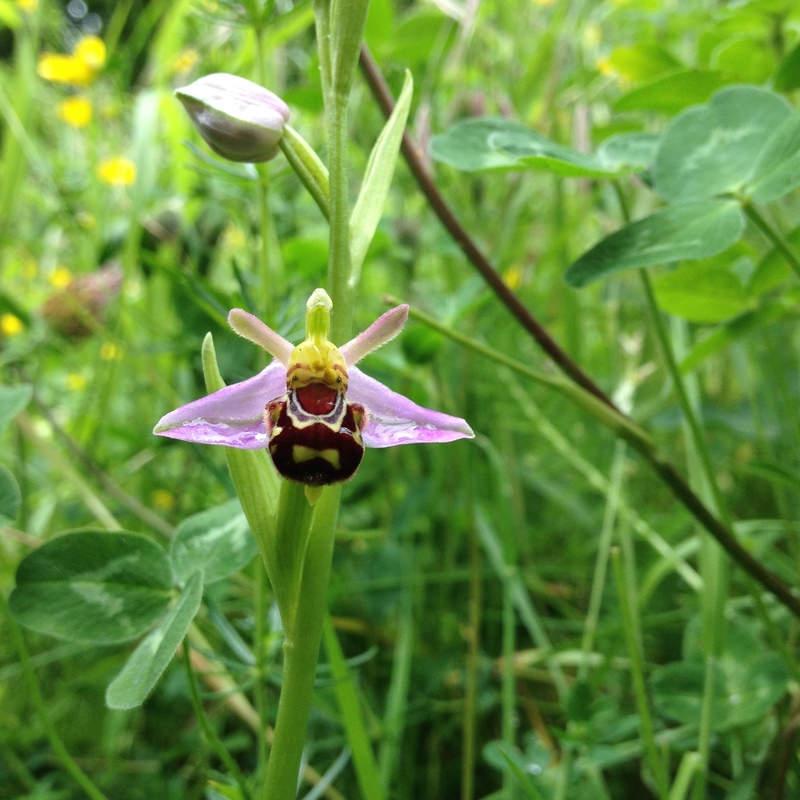 Please take a photograph and record the location and date and upload your data to the Orchid Observers website. 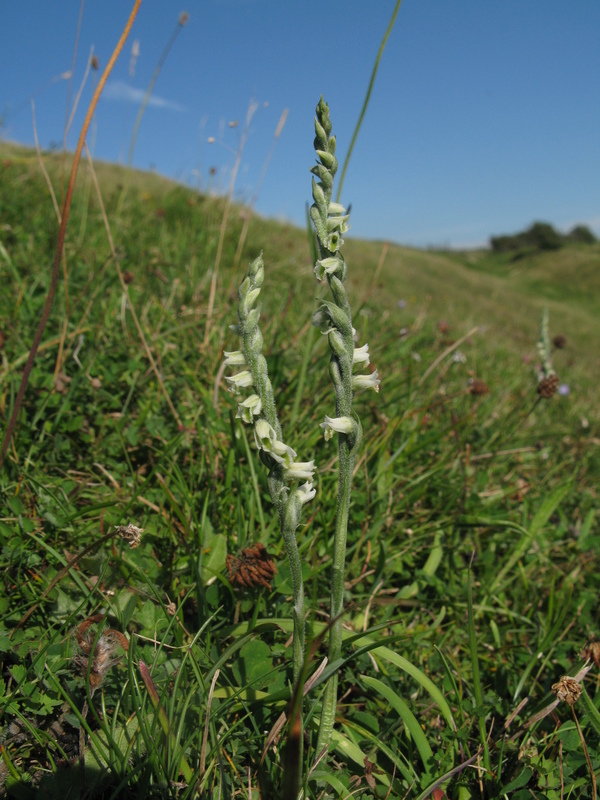 A similar looking species, but in another genus altogether, is Autumn lady’s-tresses (Spiranthes spiralis) which is found in southern England, most commonly by the coast. 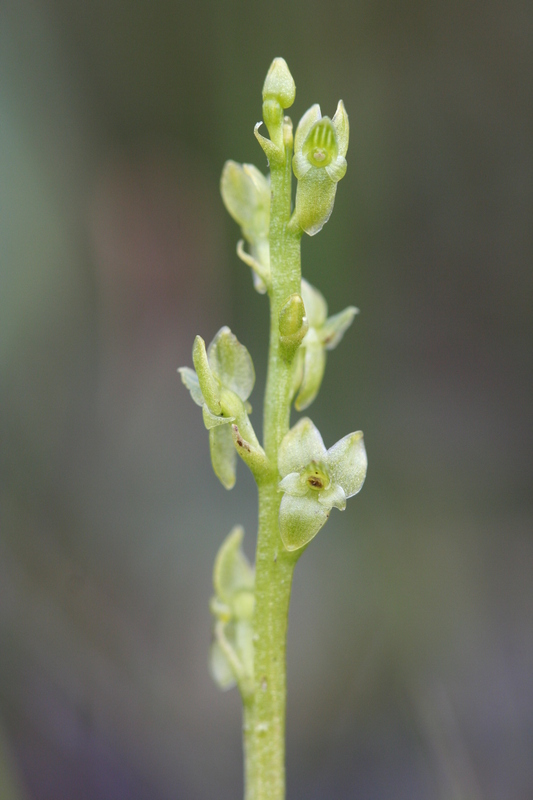 This small orchid has tiny white flowers arranged in a single spiral around the stem resembling braided hair, hence the common name. An interesting fact is the leaves develop in autumn and photosynthesise throughout the winter but wither before flowering – this is an adaptation to hot dry climates. Germination to flowering takes 14 years. 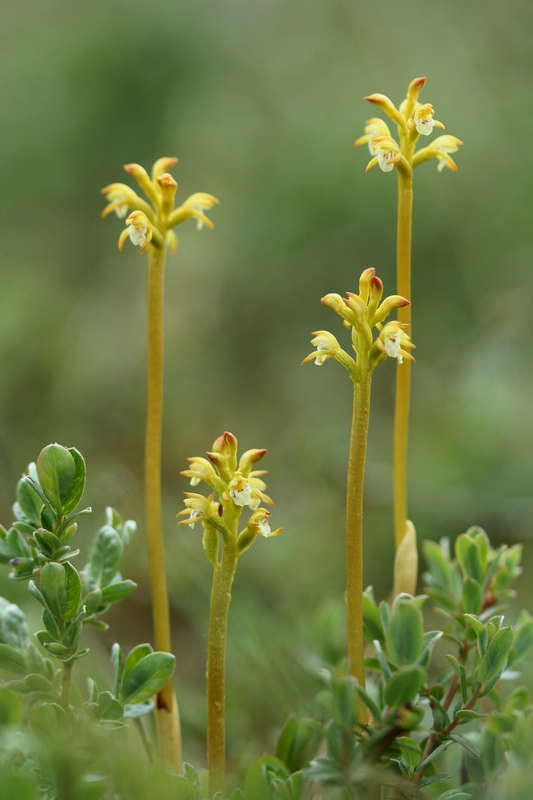 This is a Mediterranean species that only grows on calcareous grassland with very short turf. Look out for it in late August and into September on chalk downs, fixed dunes, cliff tops and even lawns and old grass tennis courts! Get your free Orchid Observers ID Guide! In addition to the downloadable PDF version on this website, we now have beautiful printed copies of our 34 page Orchid Observers Identification Guide, illustrated with photographs of all 29 wild orchids in our study, species distribution maps and details on flowering times. Please email orchid@nhm.ac.uk with your full postal address and we will send you a free copy! 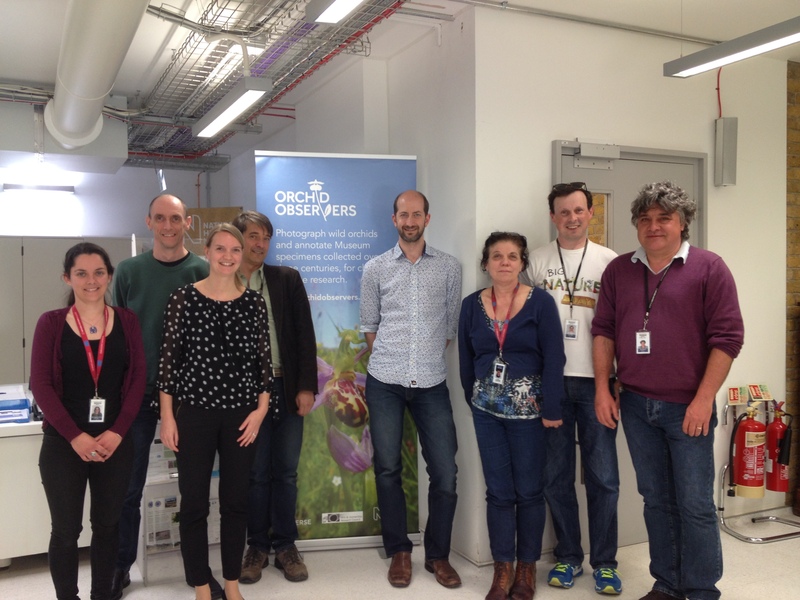 What have the Orchid Observers team been up to? 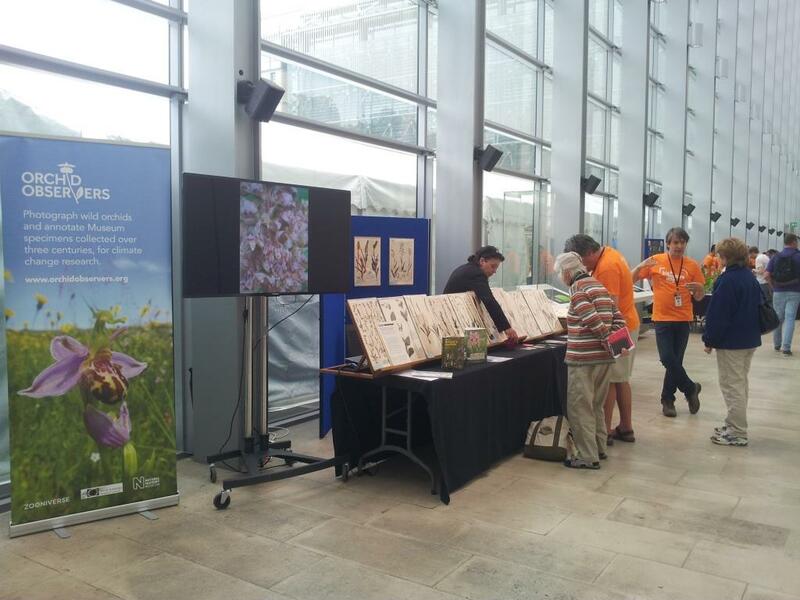 It’s been a busy time for Orchid Observers! The project got off to a great start when the website went live on the Zooniverse platform on 23 April and the very first of the season’s field records was uploaded on day one! A week in, and we recorded almost 300 people participating in the online activities and an increasing number of people uploading images from the field. 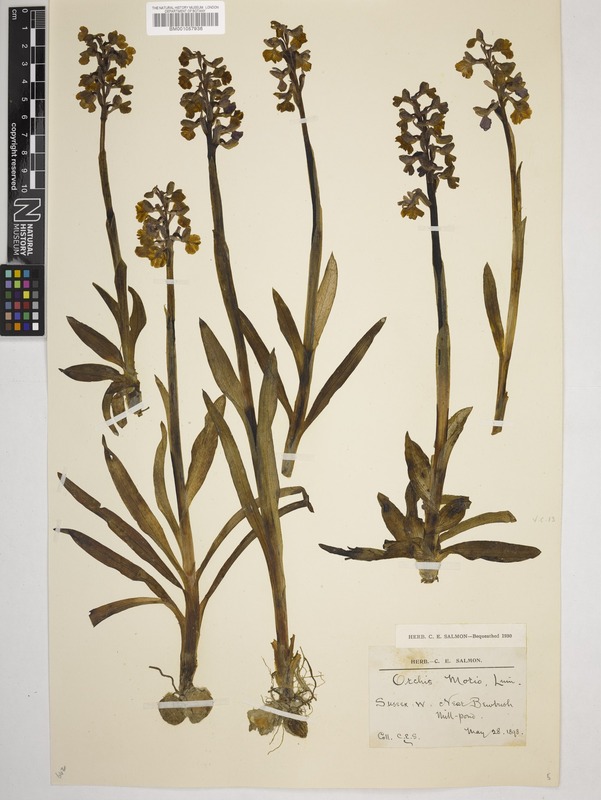 At the time of writing this blog we now have over 700 registered users on the website who have enthusiastically completed 17,589 classifications, by verifying and transcribing data for our historical specimens and identifying species and flowering stages for 1507 photographic records submitted by participants so far. The field records collected span the country, from Cornwall to Perth in Scotland, and from Pembrokeshire across to Norfolk. So far, for early-purple orchid (Orchis mascula) and green-winged orchid (Anacamptis morio) approximately 9% of the records are from new/unknown sites (as measured by 2 km square/tetrad); this is valuable information, particularly for green-winged orchid which is considered at risk of extinction in the UK. Whilst we have not as yet been able to fully compare the Orchid Observers phenology data with our museum records (the relevant, verified, 2015 UK weather data has not been released) we have already been able to see that the median date of this year’s flowering of two species (early-purple and green-winged) is at least 10 days earlier than the museum data (which mainly covers 1830 to 1970). These are early figures only, and the full data set will be analysed later this year. We are immensely grateful for the time and good will of all our participants – without this effort we would not have been able to collect these data. And we’ve still got the rest of the summer to collect more data for all our 29 species in the survey! 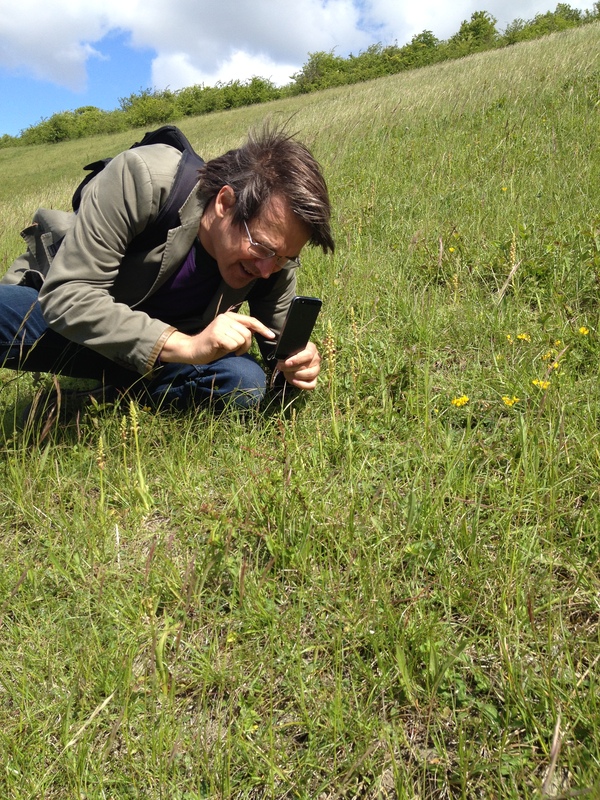 We’ve been busy filming some promotional videos about the Orchid Observers project – take a look! Mark Spencer and I travelled to Kent early one morning to meet BBC reporter Charlie Rose to film a piece on the project for South East News Today. 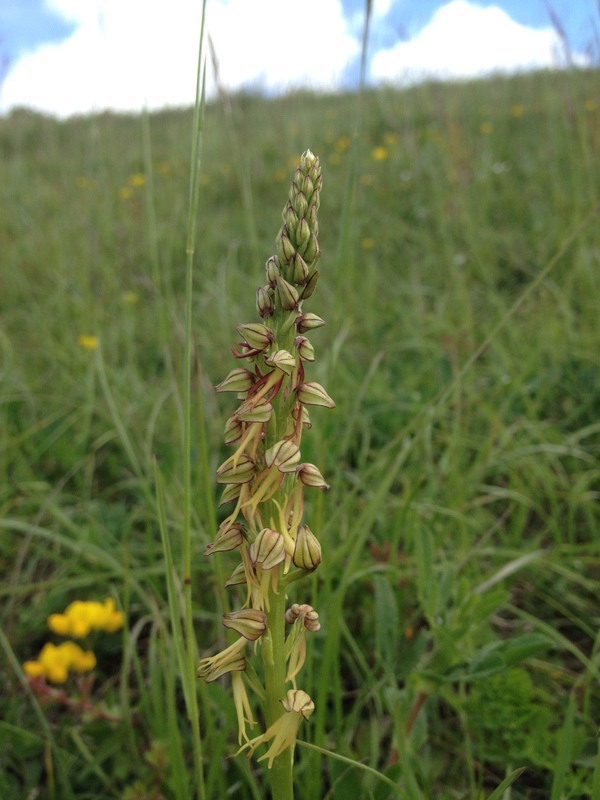 We went to Darland Banks, south-facing chalk grassland slopes which were abundant with Orchis anthropophora, the Man orchid. 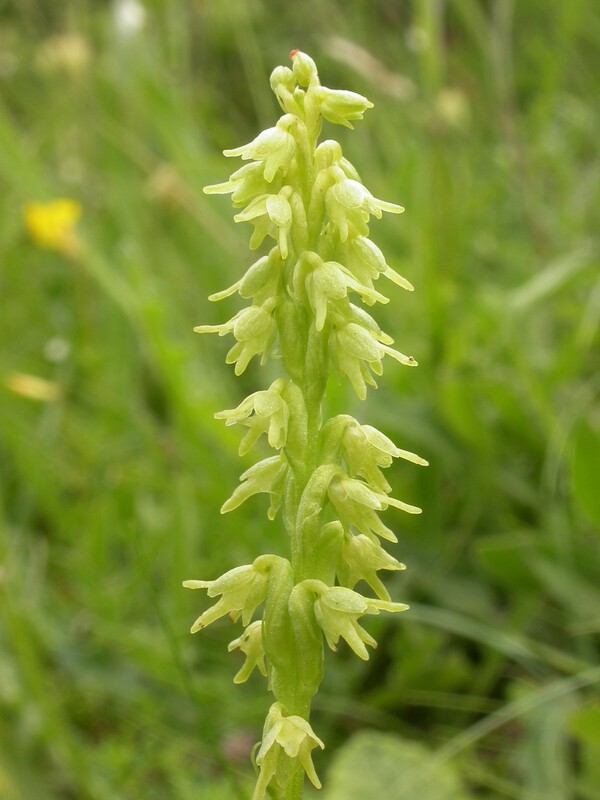 The Man orchid, Orchis anthropophora, at Darland Banks. I also organised with the Museum’s Broadcast Unit team to film a short piece to explain the research behind the project. So, mid-May saw myself, together with film crew Emma Davis and Hannah Wise, setting off early one morning with two carloads of film equipment, a group of Museum volunteers and lead researcher on the project Mark Spencer, to Oxfordshire for a day of orchids filming at a couple of the Berkshire, Buckinghamshire and Oxfordshire Wildlife Trust’s (BBOWT) finest nature reserves. We are very grateful to BBOWT’s Giles Alder and Laura Parker for hosting us. 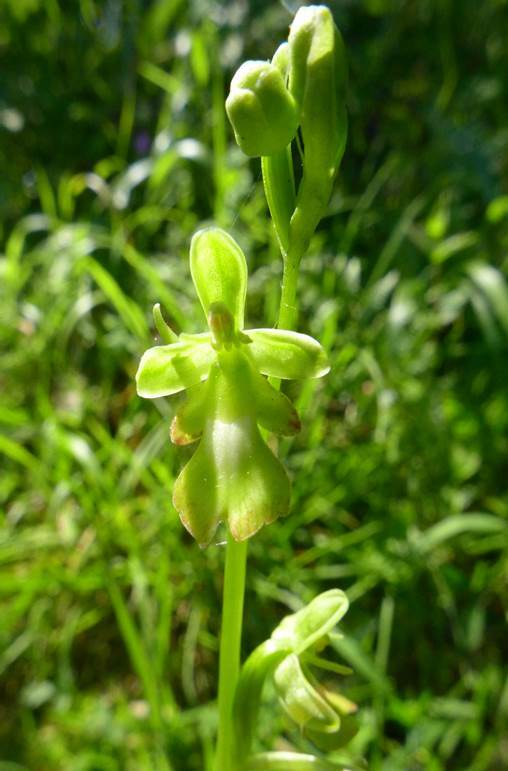 The last month has been very busy one for the Orchid Observers team. 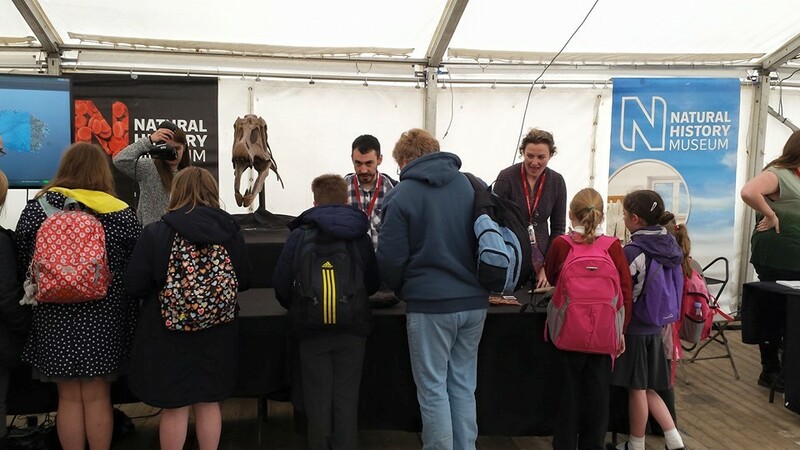 In between filming, field recording and running the now flourishing website, we’ve been showcasing the project to the public with our debut publicity events at Lyme Regis Fossil Festival followed by Big Nature Day at the Natural History Museum. Both were opportunities to engage members of the public with the project, its importance in the wider study of biological responses to climate change, and how their contributions will expand and enrich the project’s research. To draw in the unsuspecting, we erected a 50 inch plasma-screen TV with a rolling slideshow of Fred, Chris and my finest and most colourful orchid images from across the country. 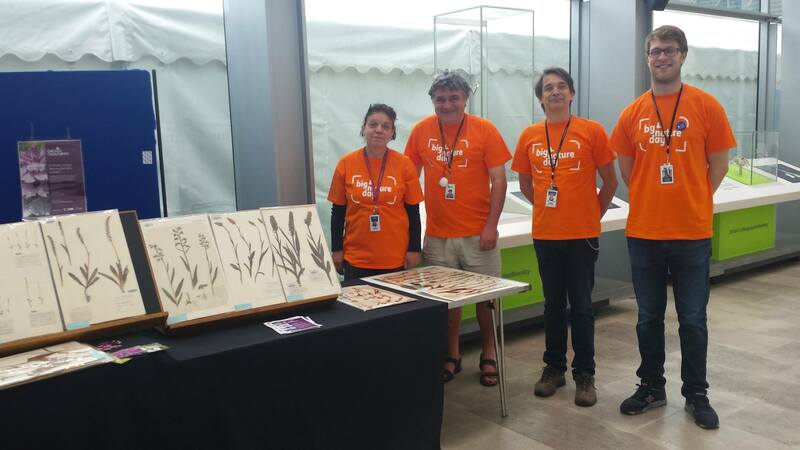 We then lavishly adorned our tables with a selection of some of our oldest orchid specimens from deep within the Museum’s herbarium – some dating back to the 1850s! 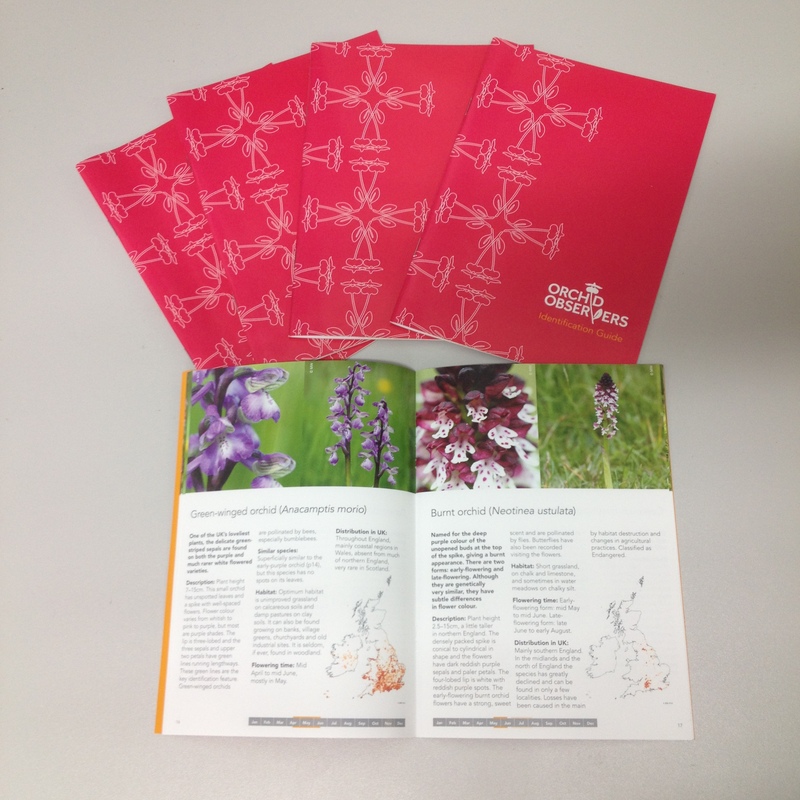 To aid with any queries, we also propped up a variety of UK orchid guides to show the breadth of orchid diversity on our shores. This, alongside our endless reservoir of passion and enthusiasm, resulted in some really enlightening and inspiring conversations. Lyme Regis Fossil Festival ran over three days from May 1st -3rd giving us a good period of time to engage a wide range of people from all over the country. This was key as it broadened our ability to spread the message of the project to areas that are less frequently recorded by observers. In order to gain a clear understanding of the orchid response to climate change, we need to be getting data from all corners of the country and so this was a real boost. We had countless inquires about where to find orchids both close to Lyme Regis and near to people’s homes – I was able to help with the latter with my reasonable knowledge of the key orchid sites in most counties. However, we were all amazed by the sheer quantity of people who were already well aware of their local orchid populations and even conduct their own flowering counts! It seems many have a particular affection for ‘their’ local Bee orchids. Thanks to Chris we also managed to squeeze in a spot of observing ourselves! During the afternoon on Friday, Kath, Chris and I drove out to look for Green-winged orchids 10 minutes from Lyme on the National Trust’s reserve of Stonebarrow Hill. What greeted us was a purple haze of Green-winged orchids in a huge variety of colour forms carpeting two ancient hay meadows. 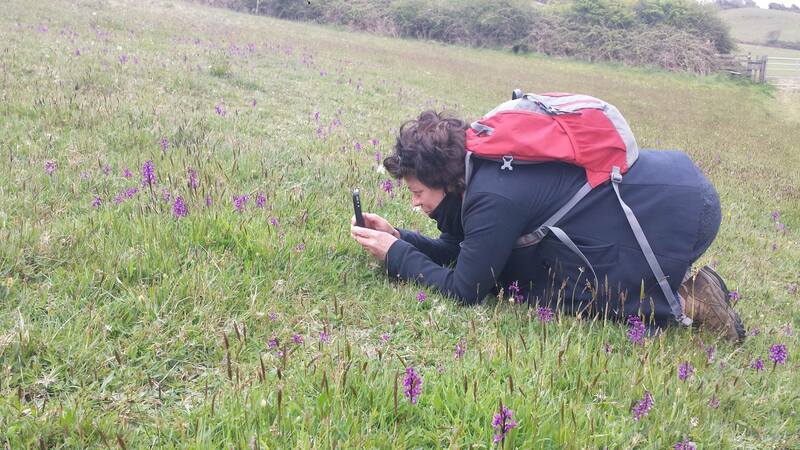 Kath was largely overcome by the experience as it has been a long-held ambition for her to see Green-winged orchids; the sight was indeed a true spectacle. 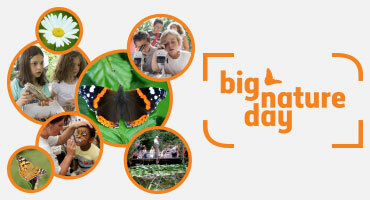 Just a few weeks after that, Big Nature Day took place on the 23rd of May here at the Museum with Fred and Mark also getting stuck in this time. Like Lyme, we were able to speak to plenty of keen members of the public with a good proportion of families showing interest. Our lovely colourful project cards seemed to be very popular with the children! Hopefully they’ll be inspired to go out and take some pictures. In the coming months, we’re looking to expand our publicity efforts and attend more wildlife-orientated events elsewhere in the UK so look out for us!